Press Sample - My regular readers know, my favorite primer is Smashbox Photofinish Primer. I love the way it blurs all of my imperfections! I also really like Too Faced's Primed & Poreless, but Smashbox is still my favorite. Well earlier this year, I got really excited to hear about Murad's NEW Invisiblur Perfecting Shield. It's a primer. It's a sunscreen (SPF 30). It has mushroom peptides to diminish the look of fine lines and wrinkles. I did not hesitate to order it from QVC (it's cheaper there $59.12)! Well during the same time, I was contacted by Murad (read here), and asked if I would like to try some products. They sent me this product as well. So I ended up with TWO! Well, I've tried it. Let me start off by saying, there are A LOT OF PEOPLE that love this product (from the reviews I read online). I have to be honest, I don't feel the same. Let me tell you why. It blurs imperfections, but for me it didn't give me the same coverage as Smashbox. I still had a lot of visible lines. It also felt much heavier on my skin than my Smashbox primer (silicon-based). It has a soft "citrusy" scent, which is pleasant but I don't particularly care for scented face products. Also, when you put on this primer, apply a thin layer and don't put on "too much", or risk it flaking (I experienced lots of white pilings). I kept adding product, because I wasn't getting the coverage I needed. The product is housed within a frosted, glass-like cylinder (so you can always see how much product you have left). It has a flat circular top, in which the product is dispensed. The packaging could be a little challenging when traveling (if that circular top breaks, there's no way to access the product). So as you can see, this didn't quite work for me. It's ok, but I didn't find it that extraordinary. I still want to thank Murad for giving me the chance to try it, and I would like to pay it forward to one of my readers. I haven't opened the second box ($65 value), so I want to give one of my readers a chance to try it! Sometimes when something doesn't work for you, it may work for someone else. This giveaway is open WORLDWIDE! Use the Rafflecopter widget below to enter. Good Luck Everybody and Have A Great Day! 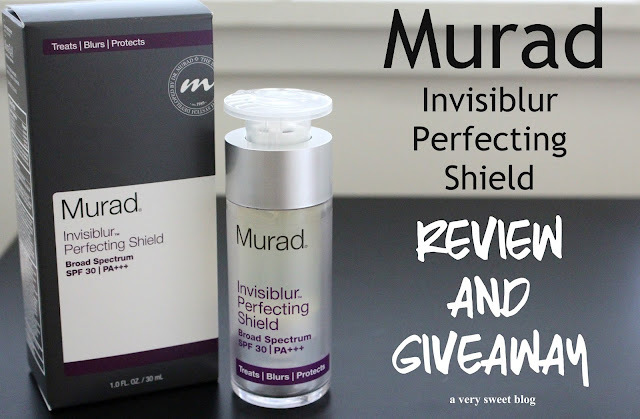 Awesome giveaway love the Murad Products. I've read a couple of great reviews about this, it sounds brilliant! This must be an amazing product! Thank you for the giveaway! I loved L'oreals Miracle Blur Primer but it stung my eyes like crazy (I think it was the sunscreen they use) so I'd love to try a similar primer from a different brand and I know Murad products are great. I've heard such amazing things about this product and have wanted to try it forever! I love murad, they have great products. we never know how a product will work on somebody else, so even if this primer didn't suit you, some reader might be really lucky to get it in this lovely giveaway you organized. Never heard the brand before! Love the review. I am not that familiar with primers! Seems a good product and nice brand. I've told you before, I am a fan too. Too Faced and the Smashbox primers are two of my go to primers. I haven't heard much about the Murad, it sounds interesting, although I do prefer a primer that can blur fine lines. Bummer this primer didn't work so well on you and you're so sweet to pass on the second one to someone else. I'm gonna sit out on this one since we have similar skin types and I have a feeling this wouldn't work for me either. I've found that the NYX primer is very close to the Smashbox primer (which is my fave). used murad in the past...would love to use again! fingers crossed! I like the Smashbox one as well. The Murad primer seem so promising, too bad it didn't work out. As much as I want to use a primer, and I have one, Hourglass which I love, I tend to not use it. I am sometimes too rushed in the morning to put it on. Have heard of this brand but never tried this product. Thanks for the great review as always!! I hadn't heard of this, thanks for an honest review! I want to try the Smashbox one now! OOH I've never heard about this primer but I definitely want to try it. Too bad this one didn't work for you!! Silicone primers don't agree with my skin, especially if they are heavy ones! The packaging to this looks nice but I can see how if the too breaks you wouldn't be able to use it! What a nice giveaway! I'm love reading about brands that I haven't tried! Great post! I love Smashbox also, the primer is just great, but I've strayed a few times, been disappointed by alot of them I'd love to give this one a go though, I've heard amazing thing's about Murad. I love Murad skincare products! I always hate when you don't get the intended coverage. Thanks for your honest review of this product. Smashbox is one of my favorites too but I would love to give Murad a try. It looks like a great product. I have read that Smashbox is your favorite primer and I am going to try it because I simply can't find one that works well with my skin. Thanks so much for this great review. I love trying Murads products. It's a pity it didn't quite live up to expectations, though it's very generous of you to offer it to your readers Kim - what an amazing giveaway! I'll leave this one for others though as I have quite sensitive skin at the moment so am keeping to the same products for a while :) Have a lovely weekend.. when we get there! This is my first time hearing about it. I am so sorry it was not too sweet for you, Kim! The most important thing is that you have already found one that works. Interesting review Kim. That's unfortunate about this product not being the best for you. I have to say that I do like Smashbox myself, but recently tried Dr. Brandt pore refiner primer and like it so far, but Smashbox is my go to! Thanks for sharing your thoughts. nice to hear they contacted you again, sometimes a word of advice goes a long way. My mom swears by Murad, but she doesn't use this particular product, and my sister even noticed that my mom's skin looked better when she uses it. But no company is good at all things. I have not used a primer but I am thinking about it. I'm happy to see that MURAD got back to you!! I love it when brands actually care about their customers! Aww that's too bad. But you're right, Kim. It may not work for you, but may work for others. I always get excited when I see products that are spf 30. I wonder if it would work better as just a moisturizer with spf than a primer. I love Murad products. great giveaway! Thanks for such an honest review. Great giveaway! Would love to try a Murad product! I've recently started to use primer and like you, I've been enjoying the Smashbox one and I also don't mind Porefessional. I too have read lots of good reviews on this Murad primer, shame that it didn't quite worked out for you, Kim but thank you for another great giveaway. I think that primer makes such a difference to how smooth your foundation lasts . this is an awesome giveaway!!! I love skin care!! Thanks for the giveaway. I'm always on the look out for new products. For a primer I swear by Max factor facefinity. Though I do like the smashbox eyelid primer! I like that you can mix with foundation. This looks very interesting - would be intrigued to see if it works for me.